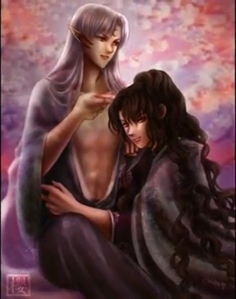 Naraku and Sesshomaru Why do toi like the paring of Naraku and Sesshomaru? Share your thoughts on this oddly far-fetched yet, intriguingly delicious couple/foes. NaraSess...how do I love thee...let me count the ways. I got into this pairing about midway through the series. I was hopelessly obsessed with Naraku from his first appearance. It was quite strange actually. I had seen Sesshomaru somewhere and started watching the show simply out of curiosity. I quickly found out what a large fan base he had. Try as I did to become a Fluffy Fan so to speak, I just couldn't. It didn't work for me. Then along came Naraku. I may sound like a freak but I never saw this romance as far fetched. I saw so much evidence throughout the series! I firmly believe it's canon. I'm possibly the only person in the world that sees Naraku as Uke as well.